For a small cost, states can save public charter schools billions of dollars and enable these schools to build long-term roots in their communities. 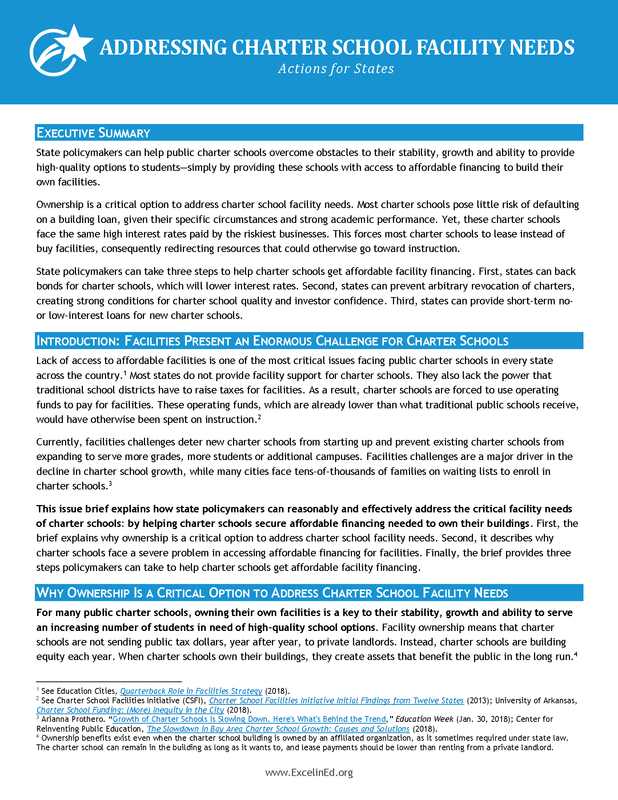 A new policy brief by ExcelinEd, Addressing Charter School Facility Needs: Actions for States, identifies actions state policymakers can take to accomplish this. Lack of access to affordable facilities is one of the most critical issues facing public charter schools in every state across the country. Most states do not provide facility support for charter schools. They also lack the power that traditional school districts have to raise taxes for facilities. As a result, charter schools are forced to use operating funds to pay for facilities. These operating funds—which are already lower than what traditional public schools receive—would have otherwise been spent on instruction. However, states can help public charter schools overcome a huge obstacle to their stability, growth and ability to provide high-quality options to students—simply by providing these schools with access to affordable financing to build their own facilities. Addressing Charter School Facility Needs shows how a state could invest $56 million in affordable financing over 30 years for a return of $2.8 billion—a 50 times multiplier. As a result, 200 charter schools could build their own buildings and fuel more investment in their communities. Most charter schools pose little risk of defaulting on a building loan, given their specific circumstances and strong academic performance. Yet, these charter schools face the same high interest rates paid by the riskiest businesses. Financing fees are also high for charter schools, particularly for smaller charter schools in rural communities. The high interest rates and financing fees force most charter schools to lease instead of buy facilities, consequently redirecting resources that could otherwise go toward instruction. State policymakers can take three steps to help charter schools get affordable facility financing. Following the model of Arizona, states can back bonds for charter schools. This will lower interest rates, and states can also subsidize financing fees for smaller charter schools. Tax-exempt bonds are the way traditional districts borrow money for facilities, and they get low interest rates unless there is evidence of significant financial mismanagement. Yet, the typical charter school faces much higher interest rates, often the same as businesses that are at high risk of bankruptcy. In fact, only a tiny percentage of charter school close each year. Most have good academic track records and stable or even growing student enrollment. Arizona is guaranteeing bonds for charter schools with good academic performance and strong financials. As a result, a broad cross-section of charter schools can access much lower interest rates. States can prevent arbitrary revocation of charters to create strong conditions for charter school quality and investor confidence. Investors expect and appreciate tough scrutiny by a charter authorizer for academic performance. However, to address the risk of politically-motivated charter revocation by a single authorizer, investors want a charter school to have options among authorizers and a fair appeals process. Like Florida’s Schools of Hope program, states can provide short-term no- or low-interest loans or grants for new charter schools, until they have a track record to secure building loans. Explore Addressing Charter School Facility Needs: Actions for States to learn more about how states can decrease the cost of ownership for charter schools and empower these public schools to provide high-quality options for students. Before Sam joined ExcelinEd as the Associate Policy Director for Charter Schools, he was a special education teacher, a school and central office administrator, the Executive Director of School Choice at Oklahoma’s department of education and the Managing Director of OPSRC’s Education Collaborative. In every position, Sam worked creatively to meet student needs. He founded the Integrated Support Program at Fischer Middle School in San Jose, California to increase the number and percentage of students with learning disabilities who have access to the general education classroom. He was the first administrator of Oklahoma’s Statewide Virtual Charter School Board, the authorizer for online schools in Oklahoma. And he co-founded a statewide afterschool network called the Oklahoma Partnership for Expanded Learning to organize and advocate for expanded learning opportunities after school and during the summer. Sam’s current interests include charter schools and their role in a functional, thriving democracy.